"we'll take the lot." 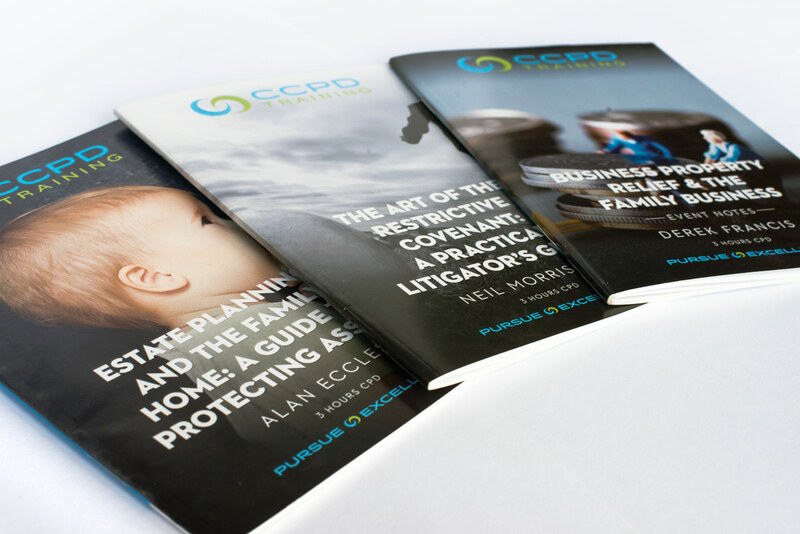 CCPD Training is the brainchild of two industry specialists who've worked in the legal training sector for years. They saw an opportunity to reinvent how training was delivered; a chance to move beyond the cumbersome nature of the big providers and instead to work in a lean, agile manner that emphasised high quality offerings, quick turnarounds, and eye-catching design. They approached me for an initial brand for the business, and the conversation quickly moved to other deliverables they wanted. I laid out what I could do, and asked what they wanted. "Everything", in this case, meant corporate stationery; a clean, responsive, easy-to-use website; email marketing templates; banner adverts for the Scottish Legal News email newsletter; promotional PDF brochures for each seminar as well as wider-scope ones for sponsorship and their other offerings; and typeset printed booklets to accompany each seminar. It was clear that this was not going to be a usual job; this was an opportunity to create their entire visual presence. With the branding nailed down, it was time to start the website. This had a number of interesting considerations; there were multiple page layouts that had to be worked up, along with embedded video content and booking forms–themselves an interesting exercise, not least because they had to rework themselves smoothly for mobile devices. CCPD are primarily a business that market their product through digital avenues. They advertise online; they use Mailchimp to market their products through email. All of this had to be carefully considered and designed to avoid diluting the brand and to keep it all instantly recognisable. 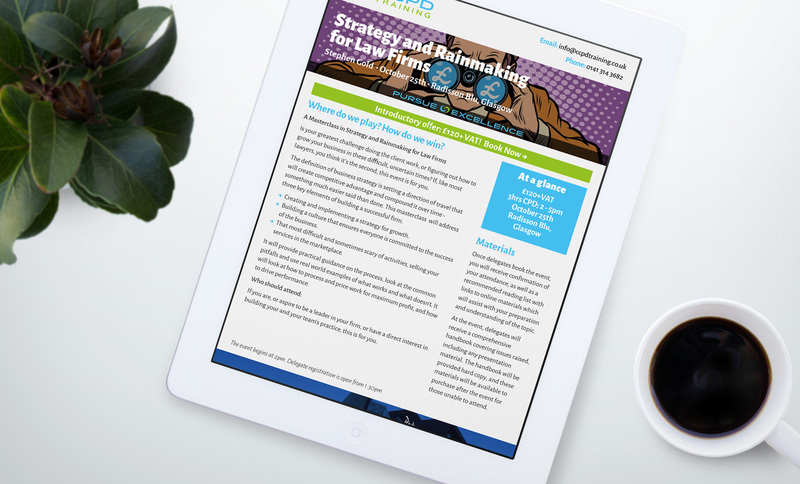 One of the more interesting challenges was the requirement for animated banners for the Scottish Legal News newsletter; it's been a long time since I've had to think about animation, and it was certainly a trip down memory lane. PDF brochures are a mainstay of their communication avenues. 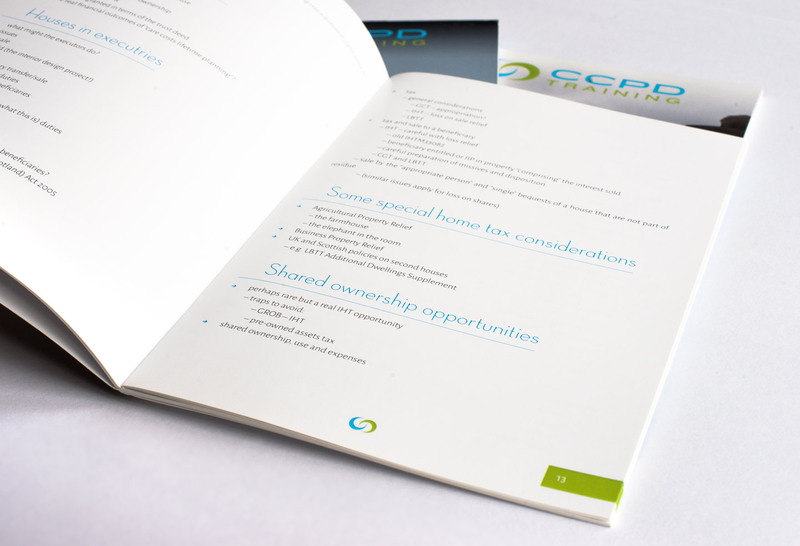 Every seminar has an accompanying brochure, all set in a controlled, branded style. Not only that, but their recent decision to market a big, all-day conference event with multiple speakers required a varation on their established branding, achieved through a subtle colour change and the use of a different, more impactful titling font. After all that, there's the event booklet itself. The speaker's notes are compiled and typeset into an attractive booklet, A5 size, to be handed out to attendees on the day. These range in size from a dozen or so pages up to over seventy, and usually require rapid, one-day turnaround. A unified approach is needed to maintain recognisability, and to keep control of the relationships between the sections—headings, sub-headings, section headings, and so on. In the end, the CCPD work is something I'm proud of. More than any other job, it required me to consider in detail every single aspect of a brand, how it's applied, and gave me the opportunity to demonstrate how good design can improve a given offering. With CCPD set to turn over six figures in their first year, I like to think I've succeeded in that.